Tow trucks are manufactured by many auto manufacturers around the world. There are many different types of tow trucks but essentially all may be divided into four general categories, these are light duty flatbed tow trucks, light duty dolly tow trucks, medium to heavy duty dolly tow trucks and medium to heavy duty flatbed tow trucks. A major difference between tow trucks belonging to the later category is that between trucks designed to tow only a single vehicle and trucks on which two vehicles can be loaded (one underneath the other), there are also tow truck onto which three or even four vehicles can be loaded. In this blog post we describe briefly the different types of tow trucks and what each one is designed to do. In the past most of the towing of small to medium sized vehicles was done using dolly tow trucks, today this is no longer the case and flatbed tow trucks have all but taken the field over completely. With dolly tow trucks only one end of the towed vehicle is raised leaving two of its wheels in contact with the road. With flatbed tow trucks the whole vehicle to be towed is pulled onto a flatbed at the back of the tow truck. Flatbed tow trucks are considered safer and easier to use, they are easier to drive and operate and so allow for quicker rides. Sometimes towing flatbed is the only option such as with vehicles badly damaged in car crashes (motorcycles too can only be towed flatbed). Still, there are some advantages to operating light duty dolly tow trucks, they are smaller and cheaper to maintain and so enable towing companies to offer attractive rates in suitable cases. So long as the vehicle to be towed is a sedan, a minivan, a station wagon, a normal sized pick-up truck etc. a light duty (either dolly or flatbed) tow truck will do the trick. With heavier, more cumbersome vehicles, such as trucks and mobile homes, a medium or even a heavy duty tow truck is necessary. Obviously, operating a heavy duty tow truck is more challenging than operating a light duty one. The forces exerted while loading and unloading a heavy vehicle to or from a tow truck are enormous, if things are not carried out properly there is real risk of accidents causing injury and even death. Towing companies which aim to provide comprehensive towing services must operate several types of tow trucks. It is also important to know which type of truck to send over in every case. 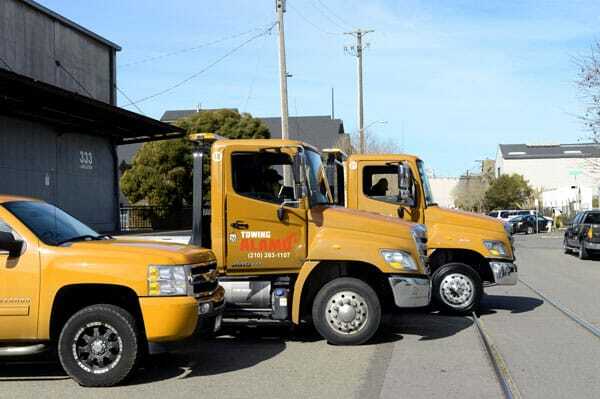 Tow techs are expected to be able to operate any type of tow truck although some techs are more expert than other with one type of tow truck or another, for instance, in every towing company there techs to whom heavy duty towing jobs are assigned. All types of tow trucks must be maintained in a manner ensuring they are safe to use, they must be equipped with all the gear which may be needed under all possible types of circumstances.